We have a special announcement! Yesterday we've added our 100th free cross stitch design. 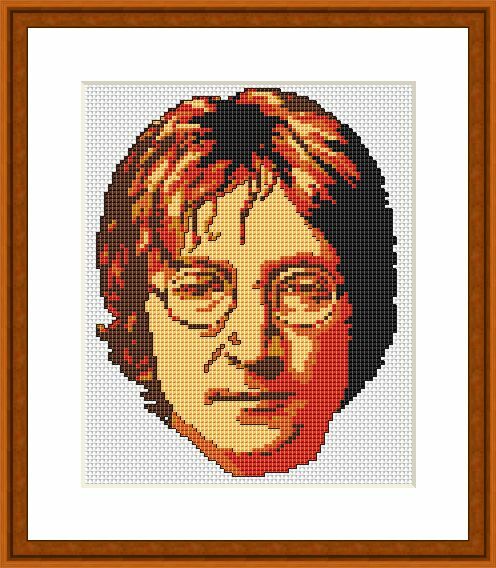 It is a portrait of the Beatles legend John Lennon. John Lennon was born, October 1940, during a German Air Raid in Oxford Street Maternity hospital, London. During his childhood, he saw little of his father, Freddie, who went AWOL, whilst serving in the navy. For several years, John was brought up by his mother's sister Mimi. "The guitar's all very well, John, but you'll never make a living out of it." After, the Beatles were famous John presented Mimi with a silver platter out of this. In the late 1950s John formed a rock group called the Quarry Men Skiffle Band. This was the precursor to the Beatles. In 1957 he met and formed a successful musical partnership with Paul McCartney. They complemented each other very well. Lennon focused on the more satirical aspects and McCartney veered towards the more optimistic cheerful qualities. Lennon was considered the leader of the Beatles, due to his superior age and also his musical abilities. It was, however, McCartney who persuaded Lennon to allow George Harrison to enter the band as lead guitarist. The first concert of the Beatles was at the Cavern club in Liverpool on 21st March 1961. After being rejected by many music labels, they eventually signed an agreement with Parlophone in 1962. During the great success of the Beatles, during the 1960s John Lennon would often be the figurehead for the group, although, they maintained that the decisions of the group were democratic. John Lennon was no stranger to controversy. In the early 1960s, he made an off the cuff remark about Jesus that landed the group in a mire of controversy. John Lennon said that "the Beatles were more popular than Jesus Christ." He claimed this was a mere observation, which was probably true in England. Nevertheless, it led to a boycott amongst the deep south Christians. There was also a wave of record burnings, although Lennon wryly remarked that to burn them they had to buy them first. In 1969 the Beatles had started to split up, it was John Lennon who was the main factor behind this. After 1970 John Lennon created a very successful solo career, often with the help of his second wife Yoko Ono. In the early 1970s John Lennon also became a figurehead for the anti war Movement. His song "Give Peace a Chance" became an anthem for the anti-war movement. Due to his anti war stance the Nixon administration tried to have him deported, but after a long struggle he was able to gain a green card in 1976. His song "Imagine" has also become a tremendously influential song; it was voted most popular song by the British public. John Lennon was shot dead in 1980, by David Chapman - an obsessed fan. The death shocked the world, both musical and non musical. where do I find this wonderful pattern?